Applications of Genetic and Genomic Research in Cereals covers new techniques for practical breeding, also discussing genetic and genomic approaches for improving special traits. Additional sections cover drought tolerance, biotic stress, biomass production, the impact of modern techniques on practical breeding, hybrid breeding, genetic diversity, and genomic selection. 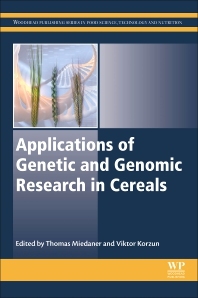 Written by an international team of top academics and edited by an expert in the field, this book will be of value to academics working in the agricultural sciences and essential reading for professionals working in plant breeding. Prof. Dr. Thomas Miedaner is scientist at the Hohenheim University and directs the work areas rye and Fusarium. He specializes in rye breeding and research, resistance genetics in rye, triticale and wheat, using molecular markers. He has published over 140 peer reviewed articles in his time as a scientist. More than 25 years’ experience in development and application of molecular markers and novel breeding technologies in cereal crops, establishment, participation and coordination of national and international projects and strategic evaluation of current and new development in area of plant research and molecular breeding.